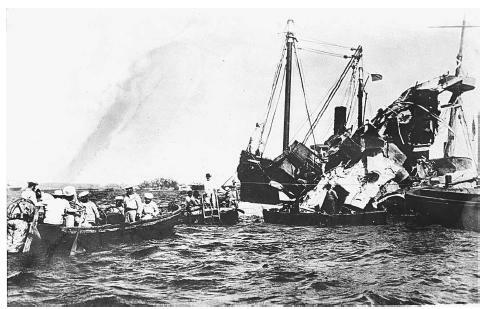 Lifeboats rescue surviving crewmen of the wrecked USS Maine anchored in Havana, Cuba, after an explosion destroyed the battleship in 1898, serving as the catalyst for the outbreak of the Spanish-American War. Within weeks of the sinking of the Maine , intelligence operatives intercepted a private letter between the Spanish Ambassador to the United States and a friend in Havana, Cuba. The letter disparaged U.S. President McKinley, and hinted at plans to commit acts of sabotage against American property in Cuba. The letter was published by several newspapers, further agitating public opinion. On April 19, 1898, Congress resolved to end Spanish rule in Cuba.